My father graduated from Jamestown High School in Jamestown, North Dakota on June 1, 1939. He was 17 years old. That day, newspapers all over the country featured at least a couple of stories mentioning Adolf Hitler and Nazi Germany. While the articles contain an undercurrent of concern, there was nothing specific in any of them that would indicate war in Europe was just 91 days away. The Shamokin News-Dispatch, in Shamokin, Pennsylvania came the closest with an ominous page 4 headline that read, “ADOLF HITLER DISPLAYS NAZI AIR STRENGTH“. According to the story, Prince Paul and his wife, Princess Olga, of Yugoslavia were visiting Berlin and the Fuhrer decided to honor them by treating the couple to the spectacle of 300 German bombers thundering overhead. Less than two years later, German bombers would, once again, thunder over the Prince and Princess’ royal heads. This time it was as Hitler invaded their country. The Nazi story that was getting the most play on June 1st that year revolved around retired US Army Major General George Van Horn Moseley’s testimony at a Congressional hearing on unAmerican activity. Apparently the Major General was a big Hitler fan and was traveling around the country praising Adolf’s policies towards the Jews. This was causing a great deal of consternation in the highest levels of the United State Government. Moseley testified before the Congressional committee that American Jews were not patriots but “internationalists” who wanted to destroy the United States. George felt strongly that Hitler’s policy of removing Jews from German society were appropriate and that he (Mosley) approved of Hitler “…taking back and placing in the hands of the German people the control of that nation“. Major General Moseley also pointed out to the Congressmen interrogating him that America needed to wake up to the fact that Jews in America were intent on establishing what he described as, “Jewish Courts“. That’s right, just as some Americans today worry about Muslims establishing Sharia Law in America… In 1939 Moseley was worried that if we didn’t act fast, one day our Constitution would be gone and we’d all be living under Jewish law. Plus ça change, plus c’est la meme chose. You only have to read a few newspapers from that first day in June before it becomes really obvious, Major General Moseley was not only very, very uptight about Jews, he was also a bigoted nutball of the most dangerous sort… The kind that can attract a crowd. However, as awful as Moseley was, I am pretty confident that the Major General and his rabid antisemitism were not what my father was thinking about that day. I am certain he was completely focused on graduating from high school. 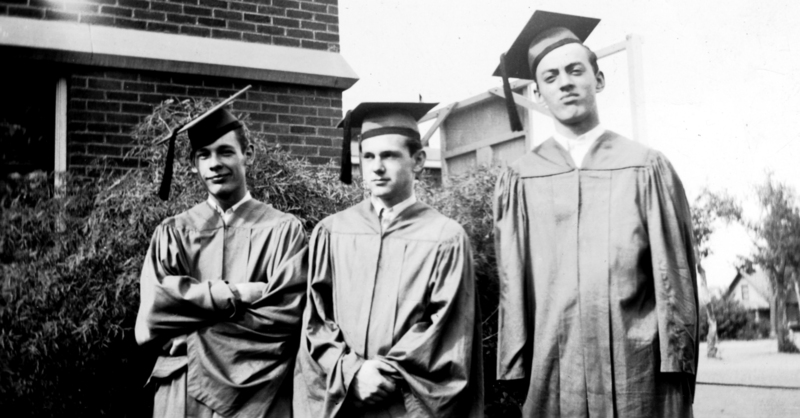 The picture at the top of the page is one of a series of 5 goofy photographs of dad (In the middle) and his two best friends clowning for the camera on graduation day. The picture below was probably taken right after my grandmother told the boys to stop horsing around so she could have a “nice one“. It looks like they gave it their best shot. On September 1, 1939, as Hitler invaded Poland, my father was in Atlanta, Georgia preparing for his freshman year at the Georgia Tech. Tech was a natural choice. His parents were from Atlanta, he was born in nearby Stone Mountain, and his grandparents, with whom he was very close, lived in the Inman Park area of the city. Like the rest of America, the Parks family had struggled mightily through the Great Depression and money was still very much in short supply. In spite of that, the family was extremely proud that my father was going to college and everyone gladly chipped in to make sure he had the financial where-with-all to get a higher education. To truly understand the family’s financial situation at that time, you have to realize that when I say they, “chipped in“, I mean they lent him money when he needed it. They expected to be paid back. 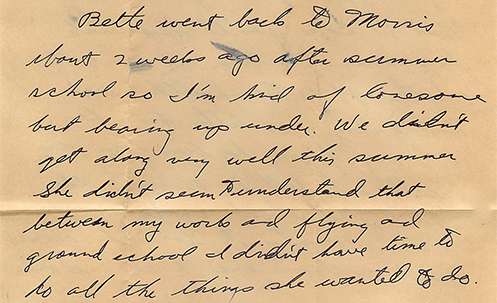 Letters from my father to his parents detail school expenses for amounts as small as 25 cents. The letters always contained an apology for the need and an assurance that the debt would be repaid. Throughout my father’s adult life, debt was was something to be avoided at all costs. If it could not be avoided, it was something to be quickly discharged. He hated owing money. If he couldn’t pay cash for it, he didn’t buy it. That included cars and houses. Growing up, when I found myself wanting something that my father thought was too expensive, I would plead, “But dad, it’s only twenty dollars“. Dad’s penny pinching was frustrating to his children but his message was clear and consistent. Plus, he was our father so we got over it. My brother, sister, and I learned at an early age, we kids were not going to get everything we wanted. However, we all got everything we needed. It wasn’t until I started reading his old letters that I began to understand the forces that had shaped my father’s thinking about money. My father’s continuing lack of funds was the major reason that, in 1940, after finishing his freshman year at Georgia Tech, he decided it was time to quit being a financial drag on the family and start making a living. Dad knew his parents weren’t going to welcome his decision to leave school but his mind was made up. Bracing himself, he met with his father to explain that he wasn’t going back to Tech. To my father’s surprise, his dad took the whole, “I’m quitting college” revelation in stride. The explosive confrontation my father was dreading was replaced by a simple question. “What’s your plan?“, his father asked. Relieved, dad asked if his father might use his business connections to help his only child secure gainful employment. My grandfather told his son he would make some calls and see what he could do. Grandfather’s business connections were extensive. Since the mid 1930s, he had worked for the Coca Cola Bottling Company helping franchise owners set up new facilities and operations. The job required frequent relocations. Between 1934 and 1939, his son attended high schools in Omaha, Nebraska, Burlington, Iowa, Rock Island, Illinois, and Jamestown, North Dakota. A few days after their talk, the senior Parks informed his son that he had good news. All my father had to do was get himself to Minneapolis. Once there, Tom Moore, the local Coca Cola Bottler, would give him a job. 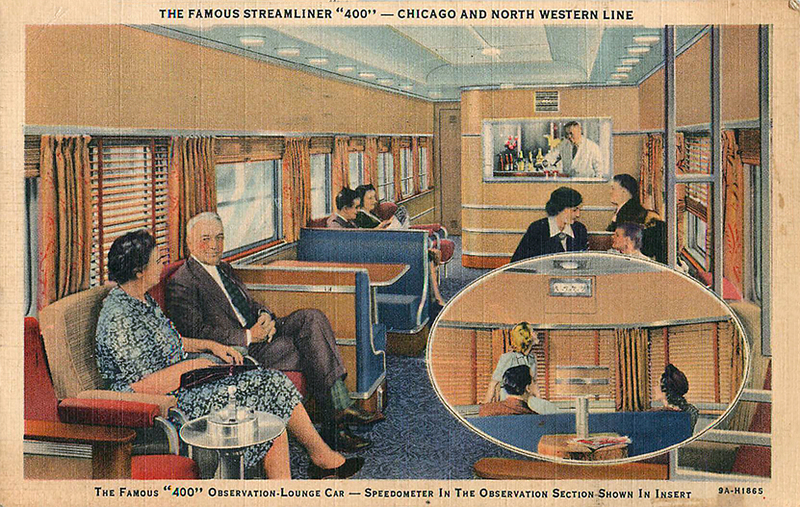 Not long after that, the now ex-college student was on a train headed for Minnesota. The day he arrived in the Twin Cities, he went to see his future employer. Mr. Moore greeted him warmly and immediately offered him the promised job. “However“, Moore continued, “there is one requirement. All the young men who work for me must be enrolled in college“. The trap was sprung. The whole thing was a set up. My grandfather wanted his son to graduate from college and wasn’t going to let a little thing like his son not wanting to go to college upset that plan. My father knew immediately he’d been out maneuvered. He was broke and a long way from Atlanta standing in front of an employer who was offering him a good job… A job he was in no position to turn down. And so, a year later, in September of 1941, dad was beginning the fall term of his 2nd year at the University of Minnesota. That summer had been eventful. Europe was at war and Japan was aggressively and militarily expanding its empire in Asia. America’s leaders knew it was only a matter of time before our nation would be involved in what was rapidly becoming a world wide conflict and preparations for that eventuality had already begun. In December of 1938, President Roosevelt unveiled a Civilian Pilot Training Program designed to make fliers of up to 20,000 college students a year. 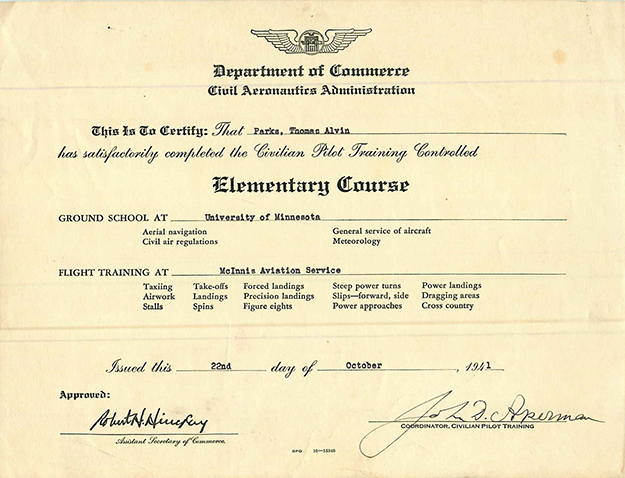 The program offered 72 hours of ground school and 35 to 50 hours of flight training… All paid for by the government. The thinly disguised catch? If a war breaks out, Uncle Sam was going to need all of those young men to put that training to use defending America. All dad heard was, “Free Flight Training“. He eagerly signed up. It had been less than 40 years since the Wright brothers had achieved powered flight and only 14 years since Charles Lindbergh had flown solo across the Atlantic. Advances in the technology of flight were coming at a furious pace and dad wanted in on the action. That summer he worked at the Coca Cola bottling plant during the day, took ground school classes at the University of Minnesota in the evenings and got his flight training from the McInnis Aviation Service out at Wold-Chamberlain field whenever he could squeeze it in. Being that busy would cause a few problems… Well, at least one problem. Bette’s given name was “Betty“. A quick check on ancestry.com of the censuses for 1930 and 1940 reveals between those years she changed the “y” to an “e“. It’s probably a good bet that the popularity of the actress Bette Davis during that same time period may have played some role in her decision. A second search of the census records for all females in the United States with the first name, “Bette” reveals that in 1920 there were a little over 1500 of them. In 1930 there were around 2500 and by 1940, at the height of Bette Davis’ popularity, there were almost 7000. As today’s young people would say, the name Bette was blowing up. Dad’s Bette definitely had stars in her eyes. 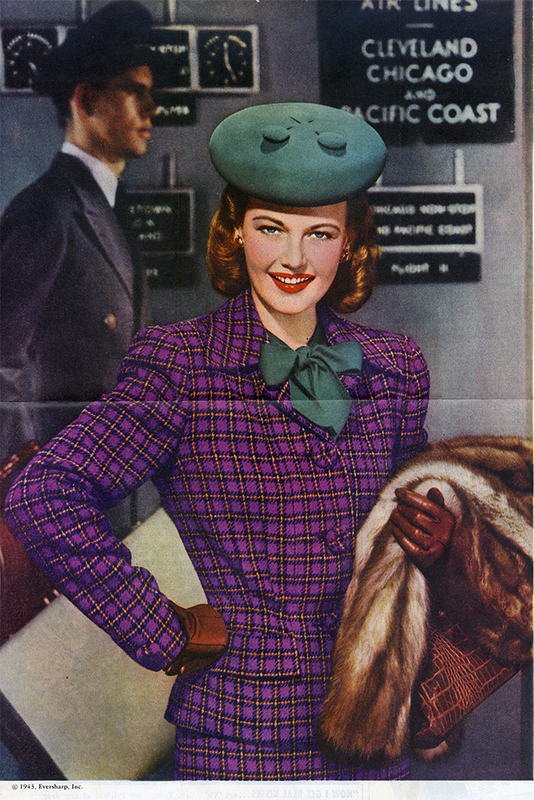 She would eventually end up in New York City, model in an ad in the Saturday Evening Post, get reviewed in Variety, and in 1947, as “Betty“, she would get a mention in Walter Winchell’s gossip column, “Broadway and Elsewhere” linking her with boxing great, Jack Dempsey. But all that was still in the future. Back in 1941, as the summer ended, dad finished his flight training and Bette went home in a huff. The Fall term at the University of Minnesota didn’t begin until late September and his girlfriend was gone… So dad took a week off from the Coca Cola plant and traveled by train to to visit his parents in Washington D.C. The last week in September Bette came back from Morris and was waiting for him when he returned to Minneapolis. Their on again off again relationship would last almost six years… Right up to the moment in February of 1947 when my father met my mother. September 23, 1941 – Postcard from dad to his parents. “Dear Folks, Arrived safely Sun. nite. Busy this week getting registered for school. Will write a long letter soon. Love, Tom Jr. When my father told the story of the events leading up to his enlistment in the Army Air Corps, it went like this. 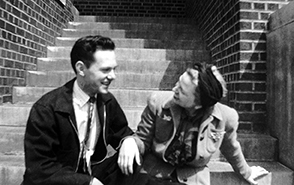 He was attending the University of Minnesota, the war started, he quit school and joined up. This straightforward recitation of what happened leaves the impression that the war interrupted his schooling. After finding the box of old letters, I discovered that impression is not entirely accurate. Apparently when the attack came, my father was already thinking about bailing on college… again. I have no idea why dad was considering dropping out. However, the surprise attack on Hawaii and President Roosevelt’s subsequent declaration of war gave him an unassailable reason to leave. On a visit home in the early 2000s, we started talking about the war and I asked dad if he remembered the moment he heard about Pearl Harbor on Sunday, December 7, 1941. “Well, as you know, I was at the University of Minnesota. That Sunday I had gone to a matinee with… ” He paused a moment, glanced at my mother who was reading beside him on the couch, and grinned… “…a friend“. My mother looked at me over the top of her book and rolled her eyes. She was well aware of exactly who her husband had gone to the matinee with. That December, when my father left the University of Minnesota, he was 19 years old, had completed two and a half years of college, and knew how to fly a Piper Cub. He went off to enlist full of a young man’s confidence that he was ready for whatever the world had in store for him. There is nothing in our family oral history or the letters that sheds any light on how Bette took the news dad’s departure. I do know, when he informed his employer, Tom Moore, that he was leaving to join the fight against fascism, the Coca Cola bottler paid him an extra two weeks salary and told him there would be a job for him when he returned. Sixty five years later, when my father told me about it, you could still hear the appreciation in his voice. January 26, 1942 – This small piece of paper marks the beginning of 20 months of preparation that ends with 2nd Lt. Parks reporting for combat duty with the 96th Bomb Group based at Snetterton Heath in that part of England known as East Anglia. A great tribute to the events in your family’s lives leading up to the war. GP… Thanks. The Parks family story is really the story of so many American families during those turbulent years. True, but all the stories are important to get a clear picture of a world in time we’ll never see again.